When you open a solution you are working with normally Visual Studio will open all the opened files you were opened in it. But if that is not happening there are two reasons why that did not happen. Second one was my issue. 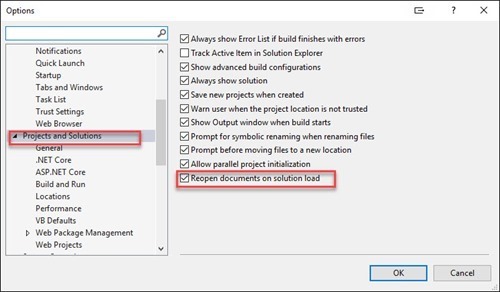 If you do not want Visual Studio to remember the opened files you can set the “Reopen documents on solution load” option unchecked. Visual Studio does not remember opened files how to fix it.